The wait is over. 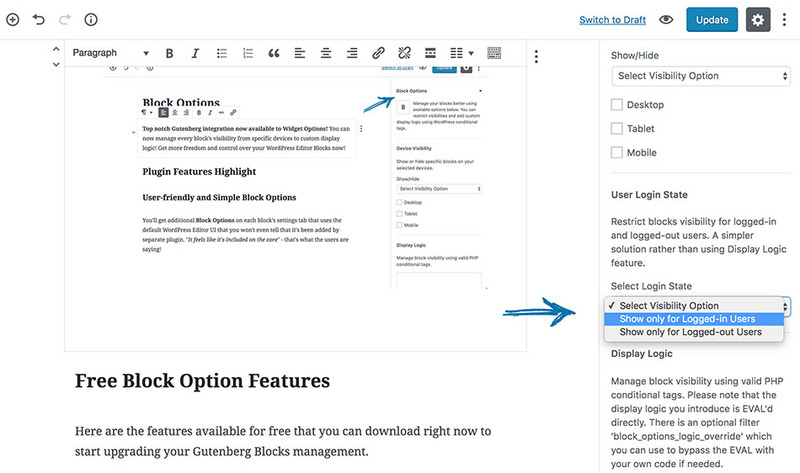 After several months of development and testing with the active Gutenberg development, I cannot be more excited to introduce to the world my brand new Block Options Plugin, a WordPress Gutenberg Editor management tool. For those who are new in the community of active plugin development, my name is Jeffrey Carandang and I’m the creator of Widget Options, one of the top-rated WordPress plugins available in the directory, which enables you to completely manage your widgets. At first, Block Options is a feature idea for this plugin and upon testing it out I’ve decided to make it a separate plugin to avoid confusion for users. Just like what I do with Widget Options, I make sure to turn my ideas come to life and make Gutenberg Editor the right plugin for you. It’s time to share my excitement with you and explain what you can accomplish using this another wonderful plugin of mine. 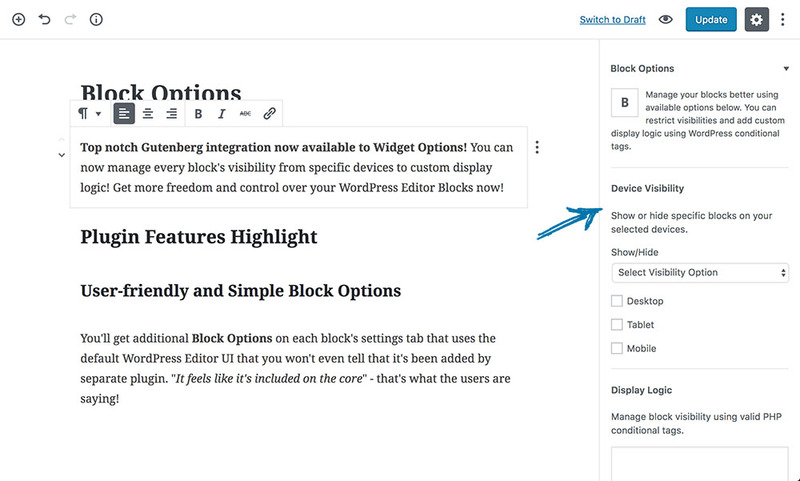 Block Options is a free plugin that’s available on the plugin directory to help you have complete control over your Gutenberg Editor blocks. I’ve created a preview video of features and how easy it is to manage those features. Read on to check each feature’s details. Enabling this feature will give you the easiest option on how to manage blocks visibility per device. You can either Show or Hide each block only on mobile devices. For those who want to display better contents for logged-in customers this feature will surely be your best companion! Just select which user state you want each block to be shown. No biggie! If you are comfortable with using WordPress conditional PHP tags or want to use your own this is your go to feature. As a developer, I know that this feature will surely help a lot and give lots of possibilities. That’s it for the initial version features for now. I hope you love ’em! I’m doing my best to make this plugin better every release, and I’m already developing more features. To get notified when more features or version are available please do not hesitate to subscribe to the newsletter. 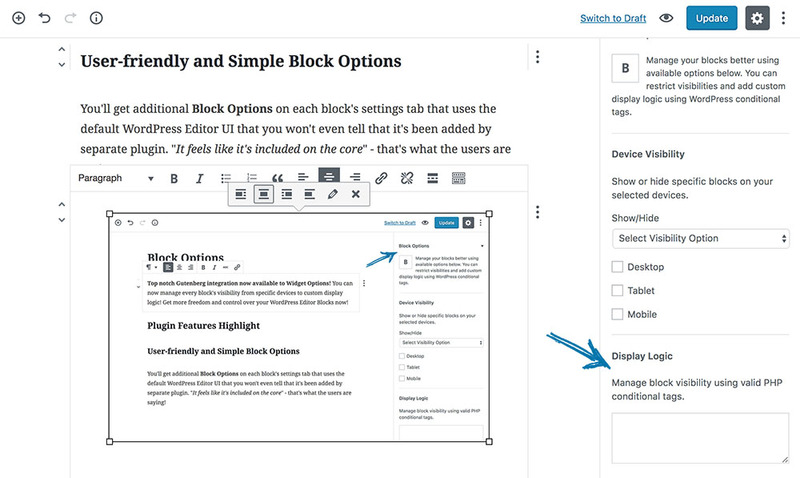 Thank you for reading and go ahead and download Block Options now and start saving time on managing your Editor Blocks and focus more on creating great contents!